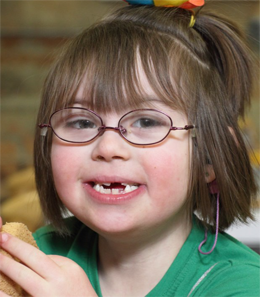 Jocelynn began her journey with Easter Seals when she was just 3 weeks old. Through physical, occupational, developmental, speech and feeding therapies, Jocelynn is flourishing. Her family says Easter Seals, “helped us to see all thepossibilities and gave us the resources to help continue to move towards newchallenges and opportunities. ” Jocelynn’s family wants her to know that she is loved and that she is an inspiration to them. Jocelynn loves swimming, playing with her brother and gymnastics. Her favorite color is blue and she loves to eat ice cream. 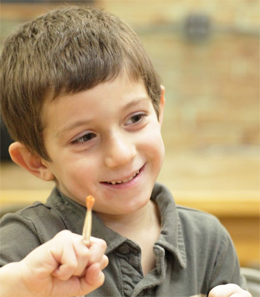 After receiving a diagnosis of Asperger's Syndrome, Davey began receiving occupational therapy at Easter Seals. Through his therapy, Davey learned to interact socially, make friends at school, control his behaviors and recently tested high enough to skip a grade level at school! He is running cross country, a top student in his 7th grade class and a motivation to anyone who meets him! Easter Seals has made a big difference in Samantha’s life. Through physical and occupational therapy she is swimming on her own, riding horses, acting and singing in the Penguin Project and most recently made her junior high school cheerleading squad. Samantha has also participated in the Miss You Can Do It Pageant.Her parents remember when Samantha was three. She attended preschool, and was using a walker to walk. Wanting to be like everyone else, Samantha devised a plan to hide her walker from her teachers. She returned home announcing she no longer needed a walker and the girl who was told she would never walk, never looked back. Tyler first came to Easter Seals at age 10 months when he was screened at his daycare and they noticed he fisted his left hand when he crawled. He was referred to Easter Seals and diagnosed with cerebral palsy.Tyler began receiving physical and occupational therapy at Easter Seals and is doing great. He has recently learned how to shoot a shotgun with his dad and tie his shoes in a double knot. He enjoys playing with tractors and eating chicken nug-gets. Meg is currently a 1st grader at Elmwood Elementary School. Meg loves school and just brought home her second 9/10 on a spelling test! When not at school, Meg is involved with tumbling class and swimming lessons. Her favorite things to do are play with her IDAP, her babies or her siblings - Noah, Caleb and Alina. She can often be found wearing sparkles or something pink because fashion is ALWAY important! Thanks to the Physical, Occupational and Speech/Feeding therapists of Easter Seals Meg continues to achieve new goals and independence each day!Alina currently a 1st grader at Elmwood Elementary School. Alina is very spunky with a smile that lights up a room. 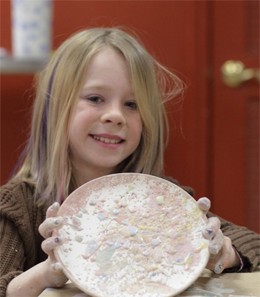 She enjoys music and art class at school. 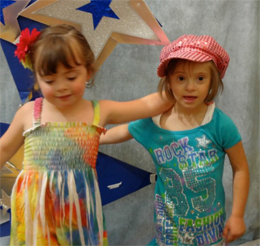 Alina takes tumbling and swim classes and finds reason to dress up and have a dance party each day. Alina started her life in an orphanage in south Ukraine, so did not have the benefit of early intervention services until she was adopted at age 3. Since then, with the help of Easter Seals therapists, she has worked to improve her speech and feeding issues. She has come a long way and each day we are thankful for the new things she is able to tell us! Jordan first came to Easter Seals when he was 3 years old. He receives warm water therapy, physical therapy and swim lessons. Jordan attends school in Morton. Jordan loves the color red and his favorite foods are ice cream and pizza. He likes playing and watching basketball, being outside, baseball and football games and loves going to watch the St. Louis Cardinals. 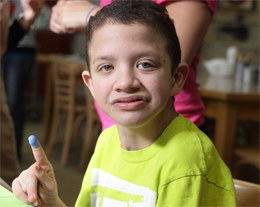 Jordan is also a participant in the Penguin Project and has attended camp at Timber Pointe the past 2 summers. 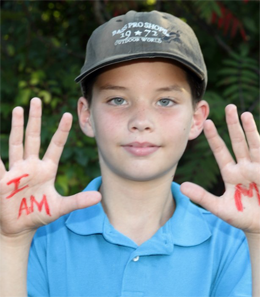 Payton began his journey with Easter Seals when he was just 3 days old. He was born prematurely, and at the age of two was diagnosed with Costello Syndrome, a rare genetic disorder that affects only 300 people in the world. 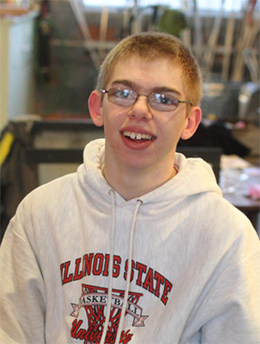 Since coming to Easter Seals, Payton has flourished. Through Physical, Occupational and Speech Therapies he is doing remarkably well and continues to do what was once thought impossible. Payton's mom Kristi says that the thing she loves about Easter Seals is, "They don't look at you like you are different, they treat everyone the same." Payton loves fishing, hunting and four-wheeling.